It’s hard to imagine any club scoring as great a first goal as FC Cincinnati did. It’s much easier to imagine what happened next, especially against a Major League Soccer power. Bertone’s shot had instinct. It had audacity. It had technique. It had execution. Teammate Mathieu Deplagne was looking for glory of his own, touching the ball past the defender to get on his right foot before it was deflected away. Bertone was more interested in directing traffic right before the shot than he was latching onto a ball so perfectly. But these are the Sounders, who have yet to miss the playoffs in 10 seasons since entering MLS. Who have advanced to the Western Conference semifinals, at worst, every single year. Who won MLS Cup in 2016. They practically invented instant success in this league. Good to have ya back, @JMoSmooth13! 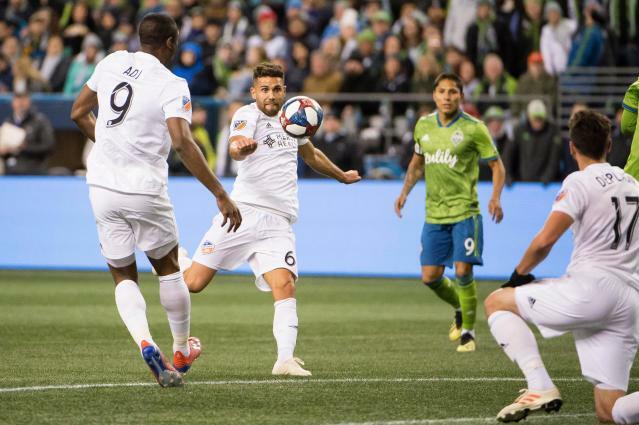 While MLS debuts have often yielded quick returns of gratification – defending champion Atlanta United won it all in its second season – there’s still a steep learning curve as the league continues to grow. Who knows how far FC Cincinnati will go this season. At least the Orange and Blue will always have Bertone’s moment of magic.